Status of Face Transplant patients now? Before we weigh in on the controversy over face transplants (e.g., if the recipient looks the stranger who donated it, won’t he/she be a “walking dead” zombie? ), let’s catch up with some of the recipients thus far. The following “where are they now” story describes several of the America’s facial transplant recipients—who’re part of a very small exclusive club. A 22-hour operation at the Cleveland Clinic gave her most of a new face from a donor: Anna Kasper of Lakewood, Ohio. Culp met the family of the donor in December 2010. She said around the same time that she was happy with the transformation. Culp, now 49, is able to smile, frown and talk, and her speech is easily understood, Siemionow said. Before, Culp did not have a nose; now, she can breathe through it. Researchers have determined that Culp’s brain accepts the new face, based on activity in key brain areas. She is an advocate of organ donation and travels to deliver speeches about her experience. “She’s a very powerful personality to actually share her experience to help others,” Siemionow said. James Maki destroyed the entire core of his face when he fell onto the electrified third rail at a Boston subway station on June 30, 2005. He also suffered severe burns on his arms and hands. His breathing was impaired, and he couldn’t speak coherently. Eating was also impossible; he was fed through a tube in his stomach. A team of surgeons and other specialists worked for 17 hours at Boston’s Brigham and Women’s Hospital to give him a new face from a donor. Maki, who wore dentures before the accident, also got new teeth during the operation. But the teeth didn’t take and eventually began to break. He’s now in the process of getting eight false teeth implanted into his mouth, and he’ll have a new set of dentures, too. He says he can’t wait to eat a rib-eye steak. Maki is also making facial expressions again. He says he has his good days and bad days. He’s taken up the game of bridge at his local senior center. Dallas Wiens underwent the first full facial transplant in the United States. When Wiens was painting his church as a volunteer in November 2008, his head got too close to a high-voltage power line. He lost almost his entire face from the burns. Doctors kept Wiens in a medically induced coma for 90 days. In March 2011, he received a new face in a 15-hour procedure at Brigham and Women’s Hospital. Wiens recently married Jamie Nash, a woman who suffered burns on more than 70% of her body after a car crash. “Our love is deep and strong, and together we will achieve greatness,” Nash wrote on the Jamie Nash TXT L8R Foundationwebsite. Mitch Hunter suffered significant injuries in a 2001 car accident, in which he received a severe shock from a high-voltage electrical wire. The Indiana man was the second full-face transplant recipient in the United States. A 14-hour surgery gave Hunter a nose, eyelids and facial animation muscles and nerves, Brigham and Women’s Hospital said. In most of his face, Hunter now has near-normal sensation. His speech has continued to improve. Charla Nash was mauled by a friend’s chimpanzee, leaving her without a nose, eyelids, lips or hands. 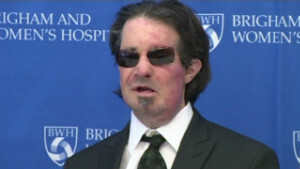 Brigham and Women’s Hospital surgeons performed a full facial transplant in a 20-hour procedure. Initially, she also received two new hands through transplantation as well. A few days later, though, Nash became sick, and the hands were removed. The first post-surgery pictures of her were released in August 2011. Richard Norris from Virginia was a gun accident in 1997 that took away much of his upper and lower jaws, in addition to lips and nose. He needed a trachea tube to breathe. He wore a surgical mask for 15 years, hiding his deformities from the world. A team of specialists at the University of Maryland Medical Center performed the procedure, which lasted 36 hours. The surgery involved replacing both jaws, as well as tongue, and skin and underlying nerve and muscle tissue, and an entire set of teeth. Essentially, his entire face was replaced except for his eyes and the back remnant of his throat. Doctors said Norris’ was the most extensive surgery of its kind. The 37-year-old spoke at a University of Maryland fundraising gala on Saturday, his first public appearance since the surgery, according the a hospital spokesman. “Thank you for the years spent preparing to give me a new life,” he said, according to CNN affiliate WJZ. Carmen Blandin Tarleton became disfigured after her estranged husband doused her with industrial-strength lye. The lye burned more than 80% of her body, and the burns went all the way through her skin. Children would run away from her because of her appearance. Tarleton was approved for a full facial transplant in December 2011, and it took 14 months to find a donor. The transplant surgery, performed by specialists at Brigham and Women’s Hospital, took 15 hours. Today, Tarleton is completely blind in one eye and partially blind in the other, but she is still able to live on her own in her apartment in Vermont. As promised I’ll try to address the current debate about face transplants in my next post. Suffice it to say, though, the procedure meets with my approval from the standpoint that it’s a better use of highly skilled and talented surgeons’ time than the nips and tucks so commonly done in Hollywood. We are a bunch of volunteers and opening a new scheme in our community. Your web site offered us with useful info to work on. You’ve performed a formidable task and our whole neighborhood shall be grateful to you. Very nice post. I simply stumbled upon your weblog and wanted to say that I’ve truly enjoyed browsing your posts. I’ll be subscribing and hope you post again very soon!